Let's start with the obvious and personal: this is the year I found my home as a writer at RT. That has meant more work behind the cameras, rather than in front - though I've had a few of those as well - and a lot more focus on US and world stories, rather than my usual Balkans beat. Between that and the disclaimer on top of the page, that accounts for the relative scarcity of blog posts. The Balkans has been the sole exception to the year of change. 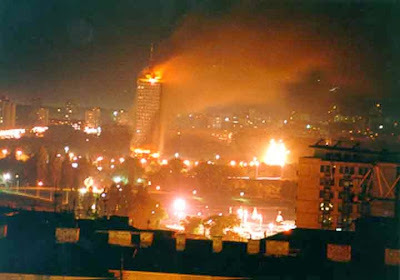 Though the peace in Bosnia has formally turned 20, the quiet, dirty war continues apace, with no end in sight. In Serbia, the quisling regime has continued the policy absolute surrender to the Empire, however gradual (see "frog, boiling of"). Everywhere else, NATO and the Atlantic Empire have reign supreme. Until the end of September in Syria. Just days before, Vladimir Putin thundered from the UN General Assembly dais, asking the arrogant Imperials, "Do you even realize what you have done?" The wreckage of Libya, Syria, Iraq and Yemen testified to the "great success" of Empire's jihad against secular Arab regimes and for Saudi and Turkish interests across the Middle East and Europe. Then, in just a month, a handful of Russian bombers did more to fight the so-called "Islamic State" than the US-led "coalition" has done in a year. Shamed into actually fighting the terrorists they were hoping to use as proxies, the Imperials still dragged their feet - and had no trouble claiming credit for Russian victories, whether in cutting off the "living pipeline" across the Syrian desert or claiming they were the ones "bringing peace and security to Syria." The desperate Empire even tried shooting down Russian planes, with Sultan Erdogan clutching NATO's skirts immediately afterwards. The Russian response was polite but firm: air defense systems that have kept the "coalition" mostly out of the Syrian sky, and trade embargoes that have hurt Erdogan's wallet far worse than his pride. If anyone in the Middle East will "have to go," it will be that wannabe-Suleiman, not the Lion of Damascus. Let it also be said that Erdogan was the one that launched the Great Migration in late 2015, using the trek field-tested by Kosovo Albanians in February. After Angela Merkel of Germany singlehandedly revoked the EU's visa policy, the human wave was all too happy to set off from the squalid Turkish camps towards the promise of German and Scandinavian welfare. The Hungarian fence only diverted them a bit, and temporarily. Along with the Syrians came others, mostly from places where Empire's endless benevolence had established progressive liberal democracy (meaning, feudal oligarchy) through "humanitarian bombing." With anyone who merely objected to the mass influx was demonized as a bigot, hateful hater, xenophobe or Nazi, the Europeans - and some Americans, too - began to wonder whether they were allowed to have their own countries at all. And so the seeds of the rebellion against the transnational oligarchy were sown, and began to sprout. Regardless how any of these processes unfold, things will never be the same as they were just a year ago. For any of us.